We've been following Yvan Bourgnon's trip since day 1 quite sad to inform about this almost tragedy. But luckily enough Yvan is alive and still wanting to finish after his 20' beachcat was completely destroyed at a beach break in Sri lank. This happened some days ago but I was waiting from Forward Sailing, that support Yvan on his Round the World attempt. For a pic on the wreckage check Daily Mail.lk. Below actual video from Yvan crying in awe, shocking images. I hope he can end this Epic journey if that is his wish. Remember he started the trip with a crew.... He is nuts, but all my respect for Yvan Bourgnon. 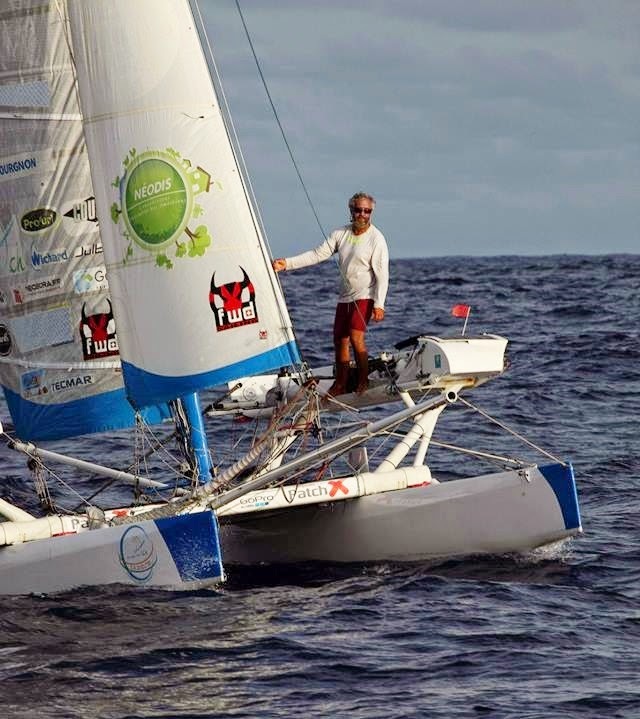 Report sent by Greg Toubel/FS: "Not very good news about Yvan, he had a big issue arriving at Sri Lanka, his catamaran was destroyed on a reef... Hopefully he is still alive and not injured : he had the chance to be ejected by a wave before the boat crashed upon the rocks. Let's start by the story of this Indian crossing which should have been the longest stage of his trip : From Bali Indonesia to Maldives Islands, 2700 miles. After a departure with good conditions, problem started with a broken rudder, then a shroud. He had to fix it alone at the top of his mast, a tough job in waves... The conditions were really hard, bad weather due to the monsoon in Indian ocean, strong wind and big waves and then total calm. He reached the Equator and came back into the Northern Hemisphere the 28th of July after 5 months sailing in the South, and around 10 month after leaving Les Sables d'Olonne. Then he decided to change his final destination to Sri Lanka due to bad weather and a long session to come only upwind still in strong wind and waves. He was more worried about damaging his catamaran than capsizing and from his position was able to reach directly Sri Lanka, sailing on the non damaged rudder and shroud. But his arrival in South Sri Lanka, next to the harbour of Gall was dramatic unfortunately. He was sleeping, boat driven by his automatic pilot, it should have gone to the South but for an unknown reason the boat changed direction and arrived on a surf spot where it was completely destroyed. It cannot be repaired. Now Yvan plans to rebuild a boat in South Sri Lanka to finish his project, he does not want to give up, but he will first need to find new partners. He already accomplished the hardest and longest part of the trip, he "only" has to sail around 10.000 km to finish in Les Sables d'Olonne, sailing only in inner seas after the end of Indian (Red Sea and Mediterranean) which should be easier than Atlantic Pacific and Indian ! Very sad but he wants to be positive and believe in his dream - being the first guy to achieve a round the world trip on a beachcat !"